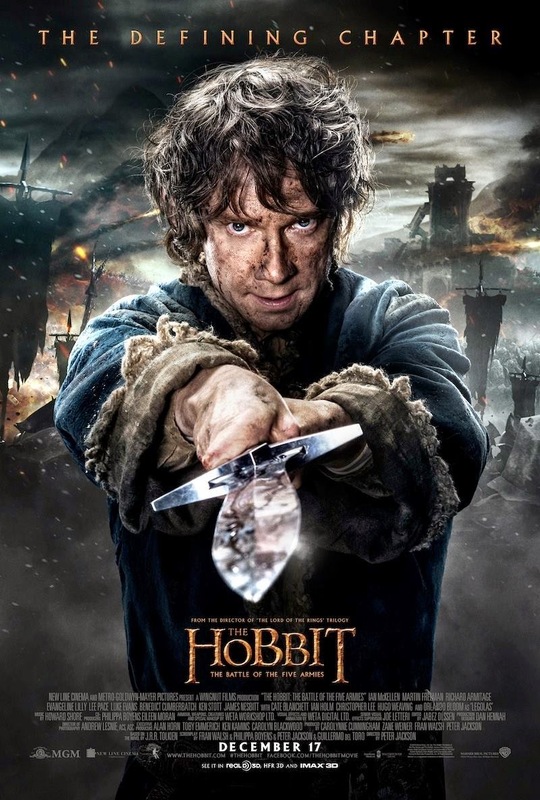 MarketSaw - 3D Movies, Gaming and Technology: New Poster Of Bilbo For THE HOBBIT: THE BATTLE OF THE FIVE ARMIES ! New Poster Of Bilbo For THE HOBBIT: THE BATTLE OF THE FIVE ARMIES ! Tim here, and it looks like we'll be getting the next trailer for The Hobbit: The Battle of the Five Armies soon because yesterday Peter Jackson shared a new poster on his Official Facebook Page. The image to the left is the new poster. It depicts Bilbo Baggins (Martin Freeman) with his sword, Sting, thrust out in front of him, and what lies behind him is the devastation of a battle with burning flags and what looks to be the ruin of Dale. Now there's nothing that explicitly states that we're getting a new trailer soon, however due to comments earlier in the year it's more than probable. Back in July when the teaser trailer was released we had been informed that the full theatrical trailer would hit in the fall. Our belief was that it would possibly be October. With the release of this poster on Jackson's Facebook it sparks the need to pay close attention again to Jackson's page. Most of the activity since the teaser trailer debut has been with regards to The Hobbit Fan Contest. Thus, this poster is an indication that activity on the page is about to increase. And we're still early in October so it could be the end of October that we'll actually get to see the trailer released. However, we're going to keep an open eye out for you and post it hear as soon as it's available. In the meantime enjoy this new poster. I hope it's the start of many more Character Posters that we'll be seeing leading up to the release of The Hobbit: The Battle of the Five Armies. The movie hits theaters December 17th, 2014 in IMAX 3D, RealD 3D, HFR 3D - all shot in native 3D with 3ality Technica rigs!